Most every person thinks that, while my actions are very pretty and attractive, and speak much in my favor, I can only really say, Coo-o, Coo-o, which they also think does not mean anything at all. Well, I just thought I would undeceive them by writing you a letter. Many grown up people fancy that we birds cannot express ourselves because we don’t know very much. Of course, there is a good reason why they have this poor opinion of us. They are so busy with their own private concerns that they forget that there are little creatures like ourselves in the world who, if they would take a little time to become acquainted with them, would fill their few hours of leisure with a sweeter recreation than they find in many of their chosen outings. A great English poet, whose writings you will read when you get older, said you should look through Nature up to Nature’s God. What did he mean? I think he had us birds in his mind, for it is through a study of our habits, more perhaps than that of the voiceless trees or the dumb four-footed creatures that roam the fields, that your hearts are opened to see and admire real beauty. We birds are the true teachers of faith, hope, and charity,—faith, because we trust one another; hope, because, even when nature seems unkind, sending the drifting snow and the bitter blasts of winter, we sing a song of summer time; and charity, because we are never fault finders. I believe, without knowing it, I have been telling you about myself and my mate. We Doves are very sincere, and every one says we are constant. If you live in the country, children, you must often hear our voices. We are so tender and fond of each other that we are looked upon as models for children, and even grown-up folks. My mate does not build a very nice nest—only uses a few sticks to keep the eggs from falling out—but she is a good mother and nurses the little ones very tenderly. Some people are so kind that they build for us a dove cote, supply us with wheat and corn, and make our lives as free from care and danger as they can. Come and see us some day, and then you can tell whether my picture is a good one. The artist thinks it is and he certainly took lots of pains with it. Range—Whole of temperate North America, south to Panama and the West Indies. Nest—Rim of twigs sufficient to retain the eggs. 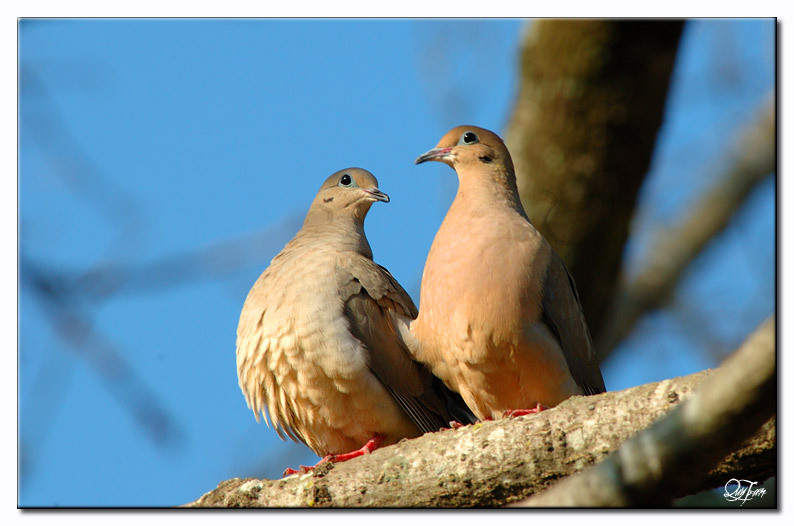 The Mourning Dove is a member of the Columbidae – Pigeons, Doves Family. They have over 330 cousin doves and pigeon that are part of the family. Doves and Turtledoves are mentioned 47 times in the NKJV. 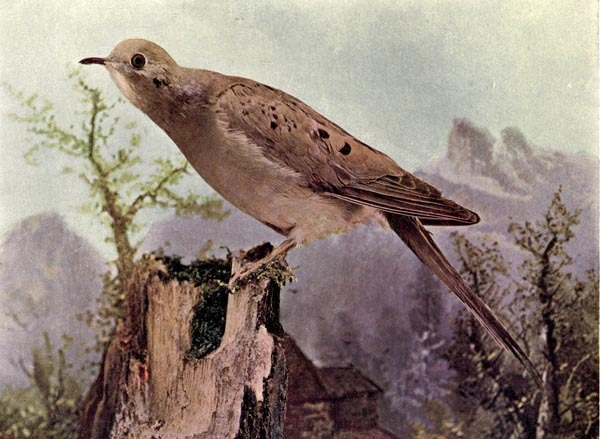 “The bird is also called the Turtle Dove or the American Mourning Dove or Rain Dove, and formerly was known as the Carolina Pigeon or Carolina Turtledove. It is one of the most abundant and widespread of all North American birds. It is also the leading gamebird, with more than 20 million birds (up to 70 million in some years) shot annually in the U.S., both for sport and for meat. Its ability to sustain its population under such pressure stems from its prolific breeding: in warm areas, one pair may raise up to six broods a year. Its plaintive woo-OO-oo-oo-oo call gives the bird its name. The wings can make an unusual whistling sound upon take-off and landing. The bird is a strong flier, capable of speeds up to 55 mph (88 km/h). The Mourning Dove occupies a wide variety of open and semi-open habitats, such as urban areas, farms, prairie, grassland, and lightly wooded areas. It avoids swamps and thick forest. The species has adapted well to areas altered by humans. It commonly nests in trees in cities or near farmsteads. This entry was posted in Birds, Birds of the Bible, Birdwatching, Christian, From The Past and tagged Birds Illustrated by Color Photography, Columbidae, Dove, Home School, Kids, Nature, Photography, Youth. Bookmark the permalink.